As part of ASP Chapter Networking and Strengthening Partnership, Executive Director Ranil Sorongon visited the island of Panay last April 16-19, 2010. The island comprises the provinces of Iloilo, Capiz, Aklan and Antique. Sorongon met with Jun Aborka, President of ASP Aklan Chapter; Neva Gregorios, Secretary of ASP Iloilo City Chapter and Maricar Pedroso, Treasurer of ASP Roxas City Chapter. Dolores “Dolly” Laudenorio, Head of the Office of Persons with Disabilities (OPDA) of Iloilo City and Regional Representative of Region VI to the National Anti Poverty Commission (NAPC)-Persons with Disabilities (PWD) Sector was the special guest. The meeting opened a new avenue for local government units (LGU) to familiarize them with ASP Chapters as well as orient the Chapter Leaders with the various programs and services of ASP. 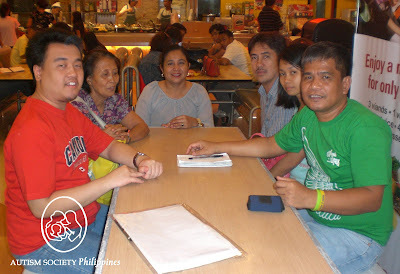 The meeting was held at SM City Iloilo last April 19, 2010. Each chapter leader reported the activities of their respective local chapters and brainstormed on the possible activities that will be implemented in the coming months. Upcoming programs include Seminars on Autism, the Alyana Movie Caravan (first Filipino digital documentary on autism), Early Detection and Intervention on Autism Project (EDEIP), Sensory Friendly Movies (SFM), and the Colors of “A” Spectrum (Photo Workshop and Exhibit); SFM and Color Photo Workshop and Exhibit will be done in partnership with SM Programs on Disability Affairs and SM City Iloilo. As representative for NAPC, Laudenorio signified her commitment to support all the activities of ASP Chapters in Panay Island. The OPDA in Iloilo City is a regular supporter of the all activities of ASP Iloilo City Chapter, from the Autism Consciousness Week to the recently concluded World Autism Awareness Day Celebrations. ASP works hard to strengthen ASP Chapters across the country. Be an Angel for Autism. The time is now. Donate to ASP Chapters and help fund programs and services for their local members. Visit our community website at http://community.autismsocietyph.org or email us at autismphil@pldtdsl.net or call us at 9266941/9298447.